Holy cow. I guess I had something to say five years ago. Sometimes my blowhard ability shocks even me. First and foremost, I was correct about Professor Terry. He found his stride and has been a invaluable part of this website. I still get excited when his new MMMM post ends up in my Inbox. I think patience and enjoying the little moments has kept me collecting M.U.S.C.L.E. figures. If it wasn’t for those two things I probably would have quit a long, long time ago. It can be such an offensively gross hobby at times. I think that AW #134 helps illustrate that grossness. 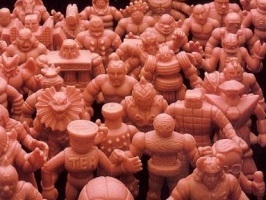 I used to think M.U.S.C.L.E. collecting could return to some loose-form of the past, but the ship has sailed. I’m ok with that. Sure, I’ll still point out the dolts – but that is getting easier and easier. The toy awards made me a little sad. I received an email about the 2018 awards and it felt too insulated to me. Too repetitive and the same old people. I guess that could be true with any award. It just feels like there is so much out wonderful stuff out there and only the same stuff is getting highlighted. Maybe it’s just me. It’s kind of funny to see those three long posts, then a short Epilogue. Does anything in that poster matter besides the picture? What a cool picture. And what a unique combination ThunderCats and M.U.S.C.L.E. figures. This entry was posted on Saturday, May 26th, 2018 and is filed under UofM News. You can follow any responses to this entry through RSS 2.0. You can skip to the end and leave a response. Pinging is currently not allowed.